As a business leader, how far are you willing to go to ensure that your company's purpose and culture are in sync? Would you be willing to relocate your entire company multiple times until you found the optimal location? Could you tolerate a call centre with no formal supervisors, call volume displays or maximum call duration? Would you be willing to adopt a ground breaking organizational structure, issue a challenge to staff to get on board or quit AND to pay those that aren't committed to leave, even if it mean that 15% of your staff departing in short order? You probably wouldn't but online clothing retailer Zappos did and on a recent trip to Las Vegas I took a side tour of Zappos HQ which I was desperate to visit because about a year ago they were in the news for a very unusual reason and I wanted to know more. Zappos has a visionary CEO called Tony Hsieh (pronounced shay), a Harvard computer science graduate who made a bundle selling his first tech company to Microsoft. Following this he founded a venture capital firm that invested in an online shoe sales company named Zappos which he subsequently went on to lead, culminating in the sale of Zappos to Amazon for approx. $1.2bn. The reason that Zappos was in the news was because of a very public switch to a non-traditional management system named 'holacracy' and the subsequent offer that they made to their staff; either commit to the change or leave with a generous settlement. As a result of this ultimatum, Zappos lost approximately 15% of their staff who were unwilling to commit. Pretty significant. So when I took the opportunity to visit Zappos it was with more than an ounce of curiosity about what kind of company would accept that kind of voluntary turnover event and how it's worked out for them. Like many tech firms Zappos are not afraid to experiment and change - fail early, fail often is in their DNA. Having started in San Francisco they moved the company lock, stock and barrel to the mid-west in order to be close to their national distribution centre. Once things were running smoothly they headed back west and settled in a Vegas suburb. They recently ended up in downtown Las Vegas in the former City Hall which they have made their own at a cost of about $45m to house their 1,500 staff. This downtown location serves Zappos needs well because Vegas is a fast growing city that is still a relatively affordable place to live, given the sunshine and world class leisure opportunities that it affords. It also supports the 24/7 nature of Zappos operation superbly. Mr Hsieh is serious about Las Vegas and has invested $350m of his own money into an initiative called the Downtown Project which aims to revitalize this formerly rundown and somewhat seedy part of town into a place where people would want to be. 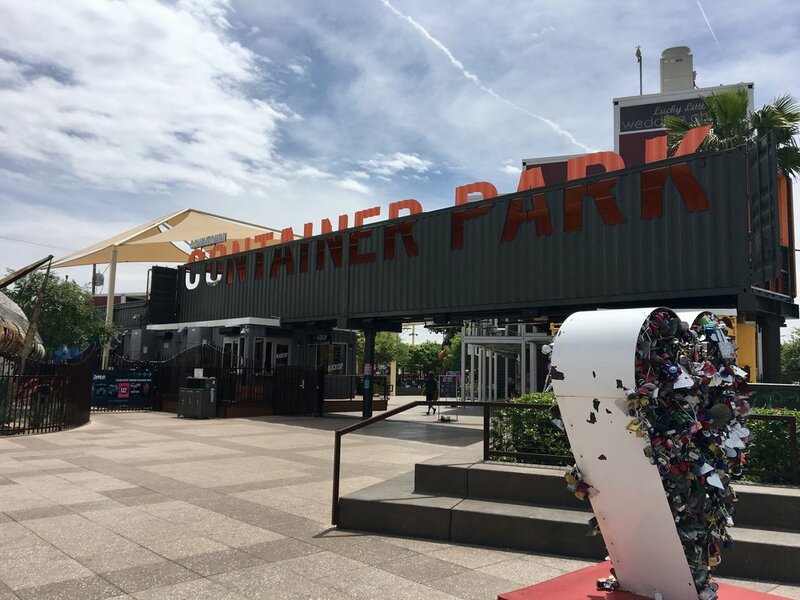 One of their projects is the Downtown Container Park which is a fun and child friendly area to hang-out and sample the wares from a variety of small start-up businesses located in the surrounding repurposed shipping containers. Mr Hsieh has also invested in the Gold Spike hotel & casino which has been transformed into an after work hang-out as well as providing co-working and super affordable co-living 'crash-pad' spaces for Zappos employees. Mr Hsieh himself lives in a form of co-living in an upscale trailer park (Airstreams of course) just a few blocks from Zappos HQ. The whole initiative has been something of a limited success but one has to admire it's good intentions. The plaza at Zappos HQ. The Downtown Container Park retail start-up incubator and family friendly hang-out. The enormous patio at the Gold Spike complete with AstroTurf covered seating, stages and the obligatory Airstream trailer. Our tour commenced with a video showing a potted history of Zappos and one unlucky visitor having his necktie cut in half - because ties make Zappos employees feel nervous. The alternative was to lose the tie or wear it around one's head for the duration of the tour. It's a bit of a gimmick but it made a point that they are non-corporate and they do donate money to charity for every tie that they destroy. The tours are conducted by a member of the Zappos Insights team who act as ambassadors for their corporate culture. Zappos are so proud of their approach to culture that they set up the Insights team as a consultancy to offer their services to other companies. Our tour was confined to the front of house area which like most tech startups contained foosball tables, ball pools, Lego walls and other fun elements designed to announce that we are a relaxed place to work. As we toured the Insights team's work area the fun and informality was dialled up to 11. The aesthetic was industrial with open ceilings, data cables hanging from J-hooks and power fed from surface mounted junction boxes on the ceiling providing maximum flexibility. Everyone has a height adjustable desk (1:1 ratio) and they are all heavily personalized. It looked like a bit of a Facility Manager's nightmare and as it turns out their Facilities team were previously in other unrelated roles within the organization so they completely understood the culture and that a clean desk policy was never going to happen at Zappos. 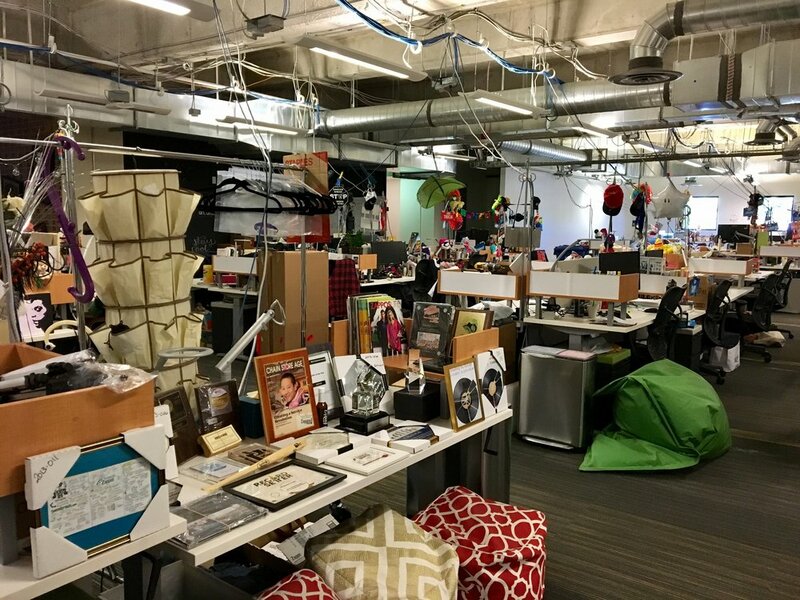 The location of a CEO's work area says a lot about an organization's culture. In Mr Hsieh's case it's right by one of the staff entrances to the building. Again, this reinforces the openness & informality of the Zappos culture. Lego wall, piano and hat for impromptu performances. CEO's workstation displaying multiple personalized license plates for long service. Zappos Insights team member workstation with mini ball pool and portrait of the Dali Llama. Employee heaven or facilities management hell? Sadly we didn't get to see any of the back office call centre areas because the 90min tour as designed does not allow it. I really wanted to get a feel for how people work here with no formal supervisors or digital displays showing call volumes and wait times - there are no imposed limits on customer calls with the recently broken record being in excess of 10 hours for a single customer call. The Insights team have a ton of this type of anecdote that really hammers home just how customer service focused they are. Too many anecdotes to list in this blog post but they were all deeply impressive to someone in the business of workplace strategy. Zappos are obsessed with their culture. They believe that other companies could copy their business model but not their unique customer focused culture. They take a lot of time to ensure that every customer is wowed by their service and to do that they aim to keep their staff energized and ensure that every team member is a good fit for this wow culture. It's not unusual for prospective employees to have 6-8 return interviews before Zappos offer them a position. Even then during the employees probation period they are confronted with three game show type roadblocks to give them the opportunity to leave if they don't feel that Zappos is right for them. One of these incentives is a fairly significant amount of cash which is no doubt tempting for anyone that is less than 100% committed. Once you're hired then the efforts that they have gone to seem to work as the turnover in their call centre is around 20%. This sounds like a lot but many call centres experience staff turnover from 40-60% annually. The call centre accounts for about half of their 1,500 employees so clearly it's worth the effort. So what about the holacracy? In a nutshell holacracy is a form of flatter organizational structure in which teams are split into small, agile, self-organizing 'circles' where the overriding aim is to complete an assigned task or support a wider company initiative. The circles are democratic and everyone has a say in how they are run with the role of manager being replaced by 'lead-links' with responsibility for connecting the circle's goals to the larger organizational mission. An example of this in practice could be a call-centre team reorganizing their work schedules in order to cover a staff absence or period of peak call volume. There wasn't a lot of time on our tour to cover holacracy and I feel that it's the type of thing that you would need to actually experience via workshops or similar in order to understand how it would work in practice but my research leads me to understand that it is advantageous for call-centres that really don't need a top down hierarchy in order to be able to function. In conclusion, I found myself deeply impressed by Zappos. Their office looks like a tech startup with lots of the 'me too' type fun elements that we've come to expect in the post Google workplace. However, what is most impressive is the length that they have gone to in order to create and maintain a WOW! experience for both their staff and their customers. 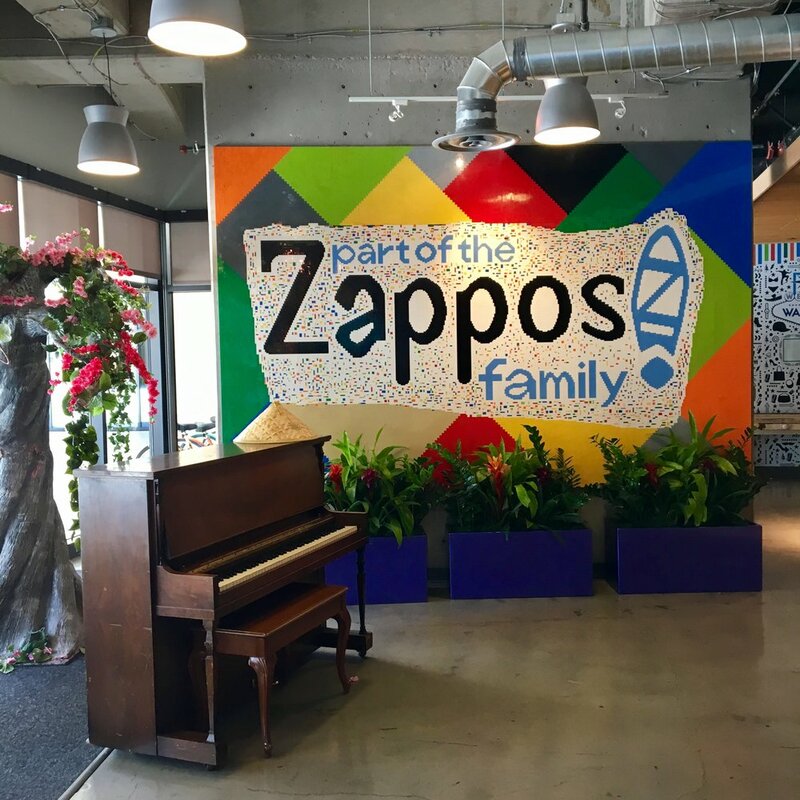 From the outside they would appear to be delivering on their cultural guiding principles and I would recommend that anyone with an interest in creating a compelling corporate culture takes the Zappos Insights tour before undertaking their next workplace change initiative. Space at Work specialize in designing workplaces. We take the time to understand our client's requirements and by asking the right questions and listening to the responses we provide solutions that incorporate best practices as well as current and emerging trends to create spaces that are agile, adaptive and ready to accept whatever change is around the corner. Please contact us if you'd like to know more. When it comes to offices...size matters. As a finance or facilities executive knowing how much space you occupy is fundamental to your ability to do your job successfully. The rent that you pay is directly tied to the amount of space that your company occupies and is expressed as dollars per square foot. Other overheads such as taxes and and operating costs can also dependent on the area. Small measurement errors can turn into big costs over the duration of a 10+ year lease. Once you know this number then you can make accurate comparisons between your costs to those of other buildings, service providers, etc. The problem is few people have this information to hand and even then you need to be sure that you've got the right number, i.e. rentable area vs. usable area, as well as knowing which measurement standard that was used to arrive at it. In the North American office market there are two measurement standards that you will come across: BOMA 96 and BOMA 2010. There are differences in how they are measured, i.e. what each includes, and you need to know which one that you're using in order to get an apples for apples comparison between candidate buildings if you're in the market for new space. The good news is that once you have this information you can know that you're armed with a powerful tool that will allow you to know: whether your existing space is efficient; how it compares to other buildings; that any long term service agreement that you're entering into is based on a real number. Getting the information is easy. If you're already in leased space then a measured survey should form part of your lease agreement. If you're an owner operator then you need to engage a surveyor such as McElhaney to conduct the survey in accordance with BOMA standards. Once you have the information then you should bring in workplace consultant to look at the numbers to see how it stacks up and help you understand whether the space will continue to work for another 10 years, or if it's one more reason why you should be considering new space. Why Do We Have Buildings? Recently I was fortunate enough to be invited to a presentation by David Lathrop, Director of Applied Research Network at Steelcase. David holds degrees in both psychology and journalism & communication theory and he is part of a team at Steelcase that poses big picture questions such as 'what are the significant workplace trends that are emerging? ', etc. which allows his colleagues in R&D to be the first to create products that meet these needs. The awesome mind and running shoes of David Lathrop. I've heard David speak on two prior occasions and find him to be inspirational because of the breadth and depth of his knowledge and his ability to demonstrate connections that many of us are unable to see. He's also an extremely engaging and dynamic speaker who can tailor his presentation to suit the topics that are top of mind to his audience thus making the whole experience more personal. Lately David and his team have been concerning themselves with the fundamental question - 'Why do we have buildings?' It might sound like a silly question but it could not be more relevant when we are now at a point where many companies and their staff have the technology to enable them to work from anywhere at anytime. Furthermore, facilities and finance executives are constantly looking for ways to reduce real estate costs by simply reducing space. The trend is definitely towards less space per person but could it and should it reach zero and if not why not? David believes that the reason that we have buildings is to 'support human activities that create value' and given that people related costs outweigh building related costs by a factor of 9x, smart employers would be wise to focus on creating space that adds value by fostering a cohesive culture, industry leading innovation and trustworthy reputation among others, because the potential financial rewards far outweigh that which can be achieved simply by a real estate space race to the bottom. So how do employers go about creating this space? David suggests that employers need to apply 'Design thinking' to the problem instead of simply 'design' applied to a solution. We at Space at Work subscribe to the same sentiment and it's one of the key reasons why we were founded. That being said it's always nice to know that there are some really smart people out there that agree. Thanks to David, Rebecca and the Steelcase team for the opportunity to drink from the well. The facilities management team at Airbnb must find solutions to problems that most of us in the field of workplace design have not even dreamed of yet. When interviewed by Jacob Morgan for the fantastic Future of Work podcast, their in-house Environments Design Lead, Aaron Taylor Harvey shared some insights that I believe can be of benefit to any employer seeking to create an ABW workplace that addresses the needs of both the staff and a rapidly growing business. I've left the information in bullet point for for ease of reading. Themed conference rooms serve to connect philosophy and meaning of business with the physical workplace. Staff sit together at meal times to enhance sense of unity and togetherness. Working from home is not a choice but staff are always working. Everyone eats lunch together, 2/3 eat breakfast and 1/2 eat dinner together. 'Belong anywhere' message is translated into space design. Hiring up to 30 staff per week (2014) which means that staff have to be inculturated very quickly. Staff are approx 70-80% Gen Y. Wants staff to have multiple modes of working without creating walls everywhere. Visual sight lines are important to help with sense of togetherness but privacy is required at times. Portland office is customer experience only (call-centre). All they need to do their job is a MacBook Air and a headset. Staff were asked whether or not they really needed a desk. People want a place to put their things and call home. Shared resources are part of company culture. Every spot in office belongs to everyone equally - belong anywhere. IDEO researched/insight based approach is used. Every design choice can be traced back to an observation. Ideal office space focuses on essential requirements to do job. Physical workspace must reflect the corporate culture. People have to live the organization that they want to be. Space should be a living diagram of the org chart. Wireless tech will free up the workspace and make designs less expensive and restrictive. Space Needs Assessment - the first step on the path toward a better workplace. You're a CEO/CFO or VP Facilities of a successful organization and the lease on your current premises is due to expire in the next three years or less. Your existing space has met your company's needs well but you've experienced sustained growth over the last several years and it's now bursting at the seams with staff working in repurposed meeting rooms, storage rooms or aisles. Clearly your company needs more space but there are some fundamental questions to be answered such as how much space and at what cost? It could be a no brainer if your landlord has space available on other floors within the building and he's prepared to lease you additional space in the building in return for your signing up for another ten years. More probably however, you will engage the services of a real estate brokerage firm to conduct a feasibility study on options such as go vs. stay, lease vs. own, existing stock vs. build to suit and the best location based on your staff demographic. In order to do this the broker will ask some initial high level questions to assess your needs and then apply space standards for your industry to give you an initial indication as to what your options are. At this point you will most likely have a choice, either A) pay for a comprehensive Space Needs Assessment to flush out your space requirements in detail or B) work with the number that your broker gave you and sign a lease on a property with only some inexpensive 'test-fit' space plans for confirmation that your needs will be met. Of course you've reviewed the space plans yourself and you're pretty happy with them so you share them with your executive team to get their approval but unless you run your company as an autocracy you'll probably receive a less than favourable response because they weren't engaged in the process and they can see a number of flaws with the assumptions that the plans were based upon. For example, you may find that the 'standards' didn't apply to your unique company after all and now you have either too much or too little space to accommodate the other project goals that your talent acquisition team was hoping for as well as insufficient space for that long term IT project and the associated contractors that you weren't aware of because they didn't appear on the org chart that you were given when your establishing your company headcount. In short, you're off to a really bad start and you've set yourself and your team up for a less than positive experience which could've been avoided had you elected to conduct a Space Needs Assessment. So what is a Space Needs Assessment and why does your company need one? A Space Needs Assessment is essentially a process that you go through to mitigate the risk of the potential worst outcomes of scenario B with the associated impact on employee morale, operational effectiveness, recriminations and ultimate effect on the bottom line. It consists of a number of investigations, activities and reports that when viewed together will give you a blueprint for your new office space that is both comprehensive and based on your company's unique mission, vision, values and culture. This comprises separate workshops for senior management and staff to investigate better ways of working. One of the other deliverables from the senior management workshop is the development of the Guiding Principles or brief which is both the roadmap for the duration of the project and the reference guide to gauge it's success upon completion. Involves the deep and detailed investigation into what your team actually need to do their work. It can be based upon interviews and/or surveys and the outcome is a comprehensive space summary report that is a starting point for senior management to use to model the effects of various initiatives and see the effect that they could have on your space needs. It's well known that most 'owned' workspaces sit empty for on average 30% of the working week. A TUS allows this percentage to be measured specifically for your organization and also the identification of areas where some degree of agile working initiative could be implemented with the potential for better use of your existing space instead of simply leasing more. Staff engagement can also be positively affected by such programs as employees appreciate the increased choice as to how and where they are able to work. The cost of a Space Needs Assessment can vary greatly with some fit-out specialists offering them for free as long as you commit to working with them. If your program is simple then this may be adequate for you but if you have a larger organization with many similarly large divisions or departments then you'll need something more exhaustive. With a comprehensive SNA carried out by an impartial consultant you may in fact find that you don't need more space because your existing space could be used more effectively. On that basis it may make sense to engage the services of an experienced workplace design consultant some time before you actually need to and definitely as early as possible before you start the process of looking for new premises so that you're ahead of the game. Space at Work are specialists in conducting Space Needs Assessments. They take the time to understand their client's requirements and by asking the right questions and listening to the responses they provide solutions that incorporate best practices, current and emerging trends to create spaces that are agile, adaptive and ready to accept whatever change is around the corner. This is where we get to share some of the interesting new developments that we're learning about in the world of workplace design. Hopefully you'll also find some topics of interest and if you do then why not share with your own followers on social media.